Sunroom plans add cheerful and relaxing space for entertaining in an outdoor setting. They are usually casual living spaces that have many windows on every side and often include glass ceilings and/or multiple skylights. All of this glass allows for amazing views of the surrounding landscape. They may be also referred to as a patio room, solarium, or Florida room. 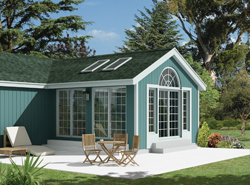 Our collection of sunroom plans includes many styles and sizes perfect all types of building needs. We offer detailed blueprints that allow the buyer to conceptualize the finished project. With a wide variety of plans, we are sure that you will find the perfect do-it-yourself project to fit your needs and style.